↑ «Canada’s largest employers by city, 2007: Quebec City.» London: University of Western Ontario. Retrieved 12 January 2009. ↑ «Labour: Labour force characteristics, population 15 years and older, by census metropolitan area.» Statistics Canada. Retrieved 12 January 2009. ↑ «Latest release from the Labour Force Survey.» Statistics Canada. Retrieved 12 January 2009. 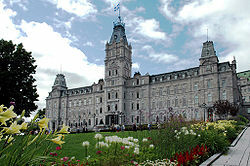 ↑ «Québec City: Economy, transportation, and labour force.» [[The Canadian Encyclopedia]]. Historical Foundation of Canada, 2008. Retrieved 12 January 2009.